It might be easier to start with what Rebicycle isn’t. Rebicycle is not simply a bicycle company. Rebicycle is not a bike shop. 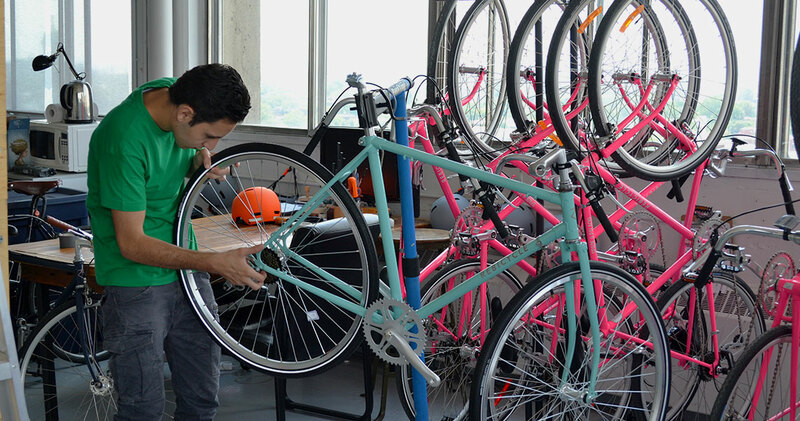 Rebicycle is rethinking what a bicycle can be. Rebicycle is inclusion, urban mobility, community collaboration, circular economy, active transportation, support of locally owned businesses, charitable giving, and sustainable manufacturing. A Rebicycle is a custom-made bicycle assembled from a mix of new and upcycled parts. Our frames are generally made of hi-tensile steel and have been upcycled from our large inventory of ethically sourced bicycles. We adhere to a strict set of guidelines in the conception and assembly of your Rebicycle, to insure a perfect balance of modern performance, safety, and classic aesthetics. Every certified Rebicycle is sold with a comprehensive fitting, performed either remotely or in-person at our Montreal gallery, and comes with our fit guarantee. 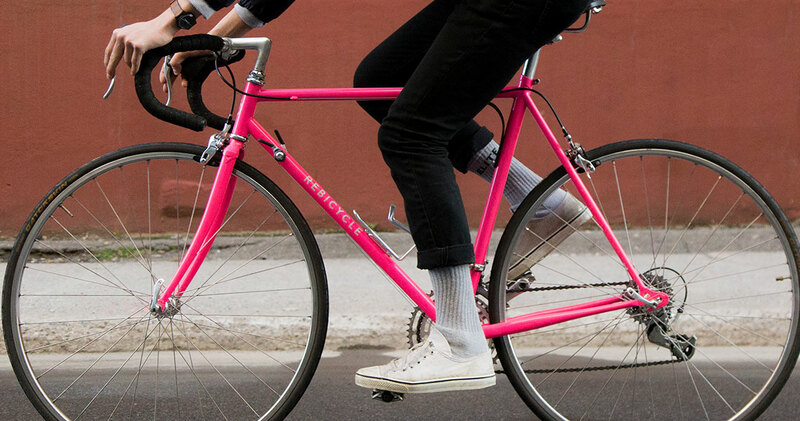 Rebicycles come in four standard colors, painted locally with an ultra-durable powdercoat finish. We can also accommodate for thousands of custom colors upon request, as well as custom decals. Check out our Instagram feed or our Gallery of past projects for some inspiration. Certifying our products and services is the only way we can assuredly raise the bar in the pre-owned bicycle market. Our 71 point inspection checklist guarantees that the quality of our certified pre-owned bicycles exceeds our customers' expectations of a second-hand bicycle. For whichever lifestyle suits you best. One of the first things we often hear from our clients is something along the lines of “I’m not a cyclist, so I don’t need a custom bicycle.” Our response: you will feel the difference. Whether you are simply riding to work from home, cruising along the boardwalk, or picking up a baguette from the bakery, our bikes will suit you ergonomically, aesthetically, and ethically. An organization such as ours is as much a product of the surrounding community as it is a product of the internal motivations of our team. As such, we are proud to collaborate with local and international businesses, projects, charities and pipe dreamers to make our world a saner, cleaner, happier place. In the past, we have collaborated with Cyclo Nord Sud to help ship bikes to the developing world, the Unitarian Universalist Church of Montreal to donate bicycles to recently arrived Syrian refugees, Spade & Palacio to produce an ethically manufactured fleet of hot pink Rebicycles used on their daily bike tours in Montreal, and many more. Book an appointment with Rebicycle at our gallery in Montreal.